Reprise by Jason Rohlf at Mott Ave Station. Rendering of Queens Far Rockaway Branch Public Library by Snøhetta. Council Member Donovan Richards and community members at the September 2016 Public Info Session. Eazy Locks at 1914 Mott Avenue. NYCEDC, in partnership with City agencies and local stakeholders, is committed to smart, community-driven investments that will better connect the Downtown Far Rockaway neighborhood to job centers, increase economic opportunity, and improve the quality of life for the people who call the area home. Far Rockaway is a neighborhood in the easternmost section of the Rockaway Peninsula in Queens Community District 14. Located at the terminus of the A train and the Long Island Railroad, and within walking distance from both Jamaica Bay and Rockaway’s famed boardwalk, Far Rockaway is home to a diverse community of residents and businesses. Downtown Far Rockaway is the historic commercial core of the Rockaway Peninsula and is anchored by the Central Avenue, Mott Avenue, and Beach 20th Street retail corridors. The downtown has historically faced many challenges, including retail vacancies, a lack of community services, amenities, housing options, and quality open space for residents and visitors. Today Downtown Far Rockaway is undergoing a transformation, and major new developments will better connect the neighborhood, increase economic opportunity, and improve the quality of life for the people who call the area home. Based on feedback from community leaders, business owners, and residents, the de Blasio administration is investing in Downtown Far Rockaway’s existing infrastructure—as well as supporting new commercial and residential developments—to strengthen and revitalize this community. In November 2015, Councilman Donovan Richards convened the Downtown Far Rockaway Working Group—a team of local and state elected officials, and community, business, and non-profit stakeholders—to develop a set of goals and recommendations to support the revitalization of the neighborhood. The Working Group continues to meet on a quarterly basis to ensure that the City’s commitments are on track. Rezoning the downtown area to unlock development potential for commercial and residential uses. Since its release, the City has made progress on all of these strategies and released an update in November 2018. Download the Downtown Far Rockaway Roadmap for Action Fall 2018 Update. 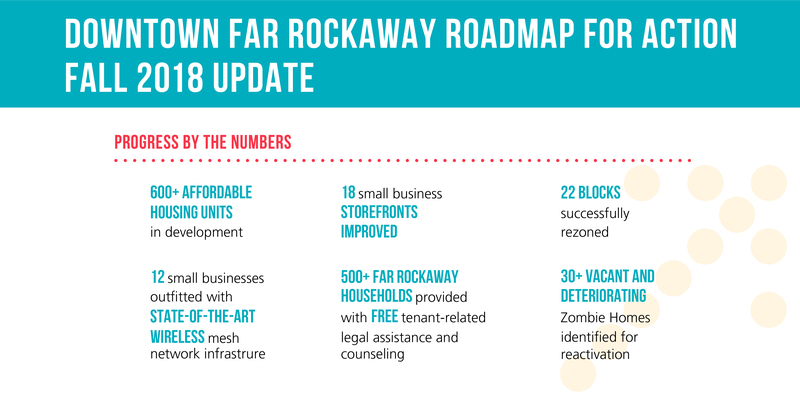 Download the Downtown Far Rockaway Roadmap for Action. For more information contact Eleni Bourinaris or Waheera Mardah.